O Wahegurujee thudh bin - without You, there is no dhoojaa - no other. Where ever I look there is You. You are the karathaar - the creator. Karehi so hoe - whatever You do, whatever You Will, that happens, that takes place. Thaeraa jor - You are the power behind the universe, thaeree man ttaek - in my mind I have Your support. With Your support sadhaa sadhaa - forever and forever Your Naanak meditates upon eaek - the One Lord, upon You alone, O Wahegurujee. 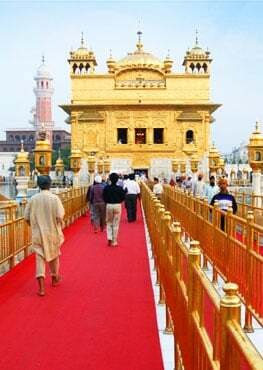 That paarabreham - that limitless Lord Waheguru is dhaathaar - is merciful and charitable upon all. Wahegurujee I have your ttaek - Your support and thaeraa aadhaar - You are the One who is my pillar of strength, the One who nourishes me Wahegurujee. I have only Your support, only Your nourishment, only You as my sustenance, You as my sustainer. Rehaao - Gurujee says pause and think about this. Wahegurujee You are present Now and the Truth Now. In the past you've always been present and in the future You are the One who will always be present. You are aadh sach jugaadh sach hai bhee sach naanak hosee bhee sach, as Guru Nanak Devjee says in the Moolmantar. The forever immortal Truth, agam agaadh ooch aapaar. Satguru Patshahjee Maharaj Guru Arjan Sahibjee is saying to us that God is agam - beyond our grasp/inaccessible, agaadh - limitless, aapaar - with no end. Wahegurujee You are limitless, beyond our mere mortal understanding and You are the the highest - ooch. Those people who serve You, those people have no fear or pain. Through the Guru's Grace Naanak gun gaahi - sings the praises of that glorious Lord Wahegurujee. Whatever I see is Your roop - Your form, O Wahegurujee. You are the treasure of all virtue, You are the seed of the universe, You are anoop - there is no other as beautiful as You, O Wahegurujee. O humble being meditate again and again with your mind, body and soul. With your mind, body and soul meditate upon that Waheguru, that Lord who is in all. O Naanak this is only found by those who have karam - who have great fortune and who have God's Grace upon them. Those people who have meditated upon Wahegurujee I am a sacrifice upon them, Wahegurujee says. Whoever, from the world, associates with them they are liberated as well by doing the sangat of those mahanpurakhs - those great blessed souls. I request, I ask for, I beg for the dhoor of - the dust of those humble beings who are in love with You, dust (of their feet - ED) of those humble saints who are Your servants. Waheguru Jee Ka Khalsa, Waheguru Jee Kee Fateh!